I'm sure you probably remember the movie Mean Girls. Ten years later, the Mean Girls quotes are still out there, and although we can laugh at the movie, what happens in real life when mean girls don't grow out of their meanness. I know that I have certainly been the recipient of some pretty mean things, and I have often been completely floored that someone would say the things that they do. I'm the product of an "if you can't say something nice, don't say anything at all" upbringing, and if I were to say some of the things that have been said to me, I would feel like washing my own mouth out with soap. It seems that for some people there are no filters, and I'm left wondering why at a certain age they didn't realize that it isn't okay to say mean things. Did the shocked looks not give them the message? Did the hurt expressions not work? 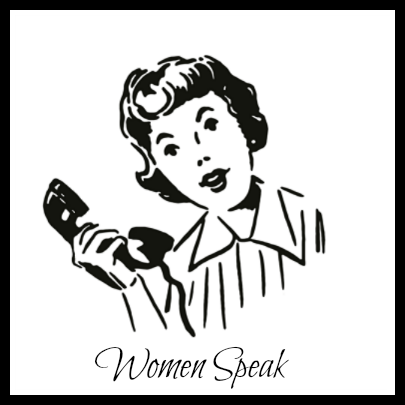 Today on Women Speak I thought we could talk about what to do when someone says something mean to you. Do you have something that you always do in response. I would love to know. At this point in my life, I just don't have time for it. Even when it is said in front of me. I just press on. Sad to say, I've known many mean girls. I pray I wasn't one of them. I know I wasn't one to gang up on another. My daughter and niece have both been a recipient of such bullying. One of our youth girls tried to commit suicide 3 times and almost succeeded the last time. Right now I'm struggling with just plain meanness in my family with grown people hurting my children. Needless to say, my husband had to get mean. I am so sorry about the girl in your youth group. I hope she is getting counseling. I don't understand saying mean things to adults, but it is intolerable for adults to say mean things to children. You definitely have to stand up when that is happening and avoid those people as much as possible. I published my comment again. I had used 2 words that became a link to a car ad! So I changed those words. I'm kind of like you. 24 hours later I think of the perfect response, but generally I just say nothing. I find that people who say those mean things are generally not someone I want to be around, and so I avoid having a relationship with them. BTW I can't imagine anyone saying anything men to you, my friend. The latest I can remember was my daughter. She did not seem like my daughter, or anyone I even knew, when these things spouted out of her mouth. If she was much younger, I could attribute it to bad judgment. But she's about to turn 40. With her, I am just speechless. I am thinking mental problems she won't get help for. I'd like to say I always no what to say because I'm known to have a sharp mind, but sometimes, I'm so taken aback by what people can say that all I can do is stare open-mouthed, which makes me look utterly stupid. But every now and then, I have the perfect reply... Like a few days ago with my neighbour... This year, my garden is a little neglected because I started a new job and at home I was concentrating on the kitchen remodel.... So my neighbour told me my garden was looking like a jungle... I answered that my garden was like my life "messy, but tasty", because at the same time she said that she was eyeing my raspberries and tomatoes! If someone says something really mean to me then usually they can expect to no longer be friends with me or have anything to do with me. When I was younger, I would just take it and after the fact think of some wonderful comeback that I wish I had thought of. But now, I know I don't have to take it. I do think there is a difference though between constructive criticism and just plain meaness. I'm not talking about the constructive criticism kind. That is something that we all have to accept and know that it is for our own good. But if someone is out to just hurt my feelings then, good riddens! I guess I was always taught the same "if you can't say something nice, don't say anything at all." It seems like many parents now don't take much of a parenting role, and, as the wife of a middle school teacher, I heard a lot of mom's say some pretty spiteful things to their daughters about other girls. Seriously?? Middle school kids are pretty much spinning through their days at the mercy of their hormones, self-esteem issues, and each other. To have ADULTS (who have children) say such awful things, or do the eye rolling when someone speaks, is beyond my comprehension. People need to realize this and stop being part of the bullying problem ~~ and start to become part of the solution to the issue. We can't raise children who after bullying in school take their efforts on in life to become bullys in the workplace and then raise more bullys. I always did say something to those parents when I, myself, over-heard them. Of course more eye rolling and then whispers ensued as I walked away following my efforts, but I tried!! I do believe that we can effect change with each small effort we put forth. Kindness and inclusion won't ever go out of style. Adults need to remember that we lead by example. I've read everyone of the comments, and totally agree. It's sad that people, not just girls think they can speak their minds in public, and private and have no repercussions. Being raised like you, I hold my tongue..it's rare that I will respond, but oh later can I think of some doozies. It looks like it duplicated my comment, so I deleted one of them. I think it's probably a good thing when we don't think of that ' perfect' response at the moment. We can just add fuel to the fire. I hate mean remarks, but it does help me to try to analyze them, to try to understand why that person is mean. I think so often it's to cover up insecurity.